Audience enjoys tapas and wine while listening to book reading. “When I first walked a portion of the Camino in 2005, I looked for a sort of three-in-one book: a daily meditation, a Bible and a way guide,” explained Wittig. “I hoped to find a small personal devotional that I could easily carry with me as a daily guide for my spiritual journey. I was hoping for a book that would direct my path physically as well as spiritually. Since I would be walking and carrying all my belongings, I was interested in reducing the amount of ‘baggage’ that would weigh me down.” When she could not find such a guide, she decide to write one. Her lightweight but comprehensive book was just released last month. “Keep my feet from stumbling” is probably the most edgy of the daily readings,” revealed the author. “I share my own pilgrim experiences and then ask questions for reflection that hopefully get the reader to dig inside. I pray that this book not only guides El Camino de Santiago pilgrims along the physical path, but also helps usher them along the pathways of their hearts.” For people who have been inspired to walk El Camino de Santiago by the movie, The Way, this book is a valuable Santiago devotional and guide, complete with scriptures for The Way. Read excerpts from the walking and spiritual guide by clicking here. Wittig hopes to read from her book at The American Pilgrims on Camino (APOC) annual gathering near St. Louis, Missouri later this week. The agenda offers a 5×5 Open Mike where pilgrims have five minutes to share favorite Camino stories. The American Pilgrims Northern Arizona Chapter Pilgrims group met on Saturday, March 29, 2014, 6:00 pm in Flagstaff, Arizona, USA. For a schedule of upcoming events, click here. Spiritual and Walking Guide: León to Santiago is now available on Amazon.com as both a small, portable paper book and on Kindle for your tablet or phone. The three-in-one book offers daily devotionals with scriptures for The Way and thought-provoking questions, space to journal, and a walking guide. The journal-like guide gives you pages to write your thoughts and revelations. There is space to document dates and distance walked on El Camino de Santiago. 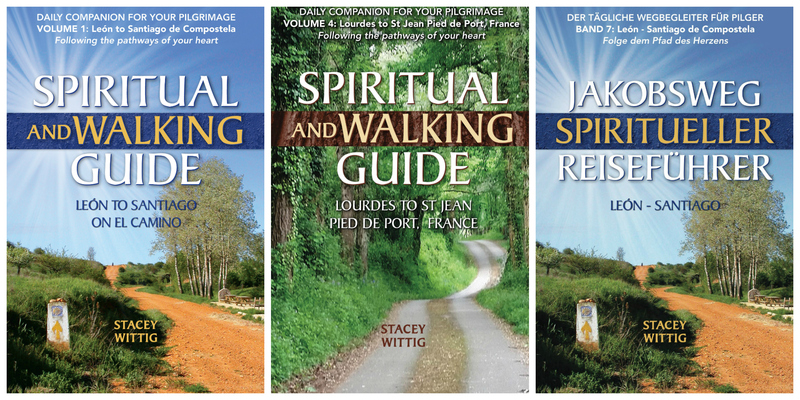 Author Stacey Wittig has walked over 880 km on Camino pilgrimage routes in Spain and France. Years of backpacking experience coupled with her love of the Lord makes a winning combination for those looking for a lightweight, all-in-one, daily Camino devotional and walking guide for El Camino de Santiago pilgrimages. The scriptures for The Way devotional were prayerfully considered for your Camino guide.